Cpl. Robert “Bob” Estle of Fayette County, right, a 94-year-old World War II Marine Corps veteran of the South Pacific, was honored with a plaque for his military service on Nov. 10 at the Brett Wightman Memorial 5K event held at the Sabina Elementary School. Left of Estle is his longtime friend, Sabina Mayor Dean Hawk. https://www.recordherald.com/wp-content/uploads/sites/27/2018/11/web1_honoree.jpgCpl. 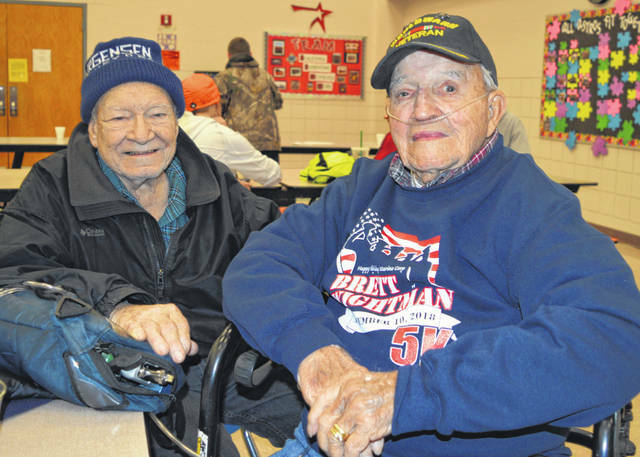 Robert “Bob” Estle of Fayette County, right, a 94-year-old World War II Marine Corps veteran of the South Pacific, was honored with a plaque for his military service on Nov. 10 at the Brett Wightman Memorial 5K event held at the Sabina Elementary School. Left of Estle is his longtime friend, Sabina Mayor Dean Hawk.